Da Yang village is located in a valley in Guanxi province. Mountains encircle the village and the sound of rushing water can be heard from each of the 52 homes. The river is the central part of the community – the people bath in it and the children play in it. The soil is lush and most of the land is blanketed with rice fields. Although the river is a benefit to the society of Da Yang, it can also become a major threat during the rainy season – when the river is prone to flooding. The average annual income for an individual in Da Yang is 1,890 RMB a year which is about $250. All of the 226 people that live here are Miao, which is an ethnic minority in China. The Miao people have a distinct culture and language. Many of the people here are uneducated and can therefore not speak the national language of Han. This is a major economic disadvantage for the people of Da Yang because they are unable to communicate in the marketplace to sell their goods. The government officials overseeing Da Yang recognized this problem years ago and contacted China Care International for assistance in building a primary school. Han Chinese would be taught to the children which would enable them effectively communicate in the marketplace in the future. Since the school has been built a few years ago, CCI has had the privilege of seeing the living standards of the village improve dramatically. However, there are still needs that are pressing for Da Yang. the surrounding hills fills the rivers and flows right through the center of Da Yang. There is currently unsuitable infrastructure to handle the force of these floods. In fact, one can see the remains of bridge on a riverbank that was helpless against the river. Currently there is a small concrete bridge that is built over the river, however, the bridge is not structurally sound and will undoubtedly be washed away during the next major flood. This specific bridge is connected to 3 main administrative villages and 6 other natural villages. When the bridge is washed over, there are 1,600 people that are unable to get their goods to the marketplace and entire villages suffer. CCI can help through providing the materials for a more firmly established bridge that can support the influx of water during the rainy season. Widening the bridge and placing larger culvers underneath it, will allow for water to flow through freely without causing flooding or damage to the bridge. The estimated cost for this 14 meter bridge is $17,400. The people of Da Yang have raised $1,250 for the construction of this project. CCI would need to cover the remaining $16,150 to put this plan into action. This bridge will promote economic development – as the people will be able to sell their goods in the marketplace anytime of the year. This project is not a difficult one, and the simplest structure can make a lasting impact to a large number of people in Da Yang and the surrounding villages. 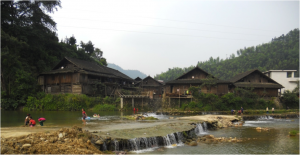 He Cun Village, or “River” Village, is a fitting name for this community that backs up to a large river. 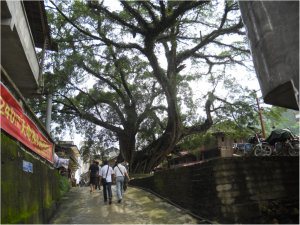 A massive canopy tree lies at the center of the village. This tree is aged and weathered, like much of the people that gather under it, including the elderly men that love to play cards and checkers in the shade. Many of the adult farmers have vacated the village in hopes of making more money at a factory job in Guangdong. The annual income for an individual is 2,250 RMB a year which is less than a dollar a day. He Cun is the central village and there are four natural villages that are attached to it comprising of 508 people. Two of these natural villages are located across the river that is 24 meters wide. The current bridge that connects these villages is constructed of pine logs and rope and is loosely supported by piles of rocks and concrete. Over 42% of the people that dwell in Rongshui autonomous county are Miao including the village of He Cun. The Miao people are a minority group in a Han-dominated China. They have their own appearance, culture and language. They build their homes with timber, they make homemade whisky out of sticky rice, and they love to dance! two natural villages on the other side of the river will be unable to sell their goods in the market and their livelihoods are at risk. Living on a budget of a dollar a day does not leave any room for risk. A larger and more firmly established bridge needs to be constructed. This bridge would need to be 24 meters in length and wide enough for the villagers to haul carts of goods across it. The total cost of this project is $15,500. The He Cun people have pooled their resources together to contribute $1,100. China Care International would need to provide the remaining $14,400 to meet the practical need of this village. This region will certainly experience economic development as they will be able to sell their goods in the marketplace anytime of the year. With a structurally sound bridge in place, the 508 Miao people that reside in He Cun will be benefitted, as well as hundreds more in the future. While most people have already pulled out of Japan and have psychologically moved on, China Care International has continued to partner with grassroots groups in Japan to build on the progress that was made since the tragedy that took place there. The magnitude 9.0 undersea earthquake, and the subsequent tsunami, destroyed everything in the local area. Houses, roads, utilities, schools, shops, and left no foundations to be built on. The Japanese National Police Agency report confirmed 15,867 deaths, 6,109 injured, and 2,909 people missing, as well as 129,225 buildings totally collapsed, with a further 254,204 buildings half collapsed, and another 691,766 buildings partially damaged. Major damage was done to and caused the shutting down of local nuclear power plants, leading to evacuations affecting several hundred thousand Japanese. The Japanese Prime minister referred to the disaster as the toughest, and most difficult crisis for Japan since World War Two. On the one year anniversary, CCI representatives traveled to Japan to attend the one year memorial ceremony held in Sendai and handed out free calenders, books, and materials to help the people who are grieving from their loss. People who had lost everything, loved ones, homes, businesses, schools, received free of charge materials aimed at helping them cope with what has happened and to help them move on to a normal life again. CCI has been providing a coffee house with coffee from South America to continue helping the people in the disaster zone. Currently CCI is still sending coffee to a coffee shop in Sendai. The coffee is given to a coffee truck that patrols the disaster area where people are working every day to rebuild their lives. The coffee truck drives into the working zones, parks, and sets up a small social corner where workers can come and drink warm coffee for free. The workers are dealing with this loss on a daily basis, and everything that they do stands as a reminder to what their country has suffered. This small act of kindness has touched the hearts of so many of the people in the disaster zone. Knowing that people are still caring and supporting them, and a free cup of coffee that can relax their minds for a few minutes, helps them deal with all they see. We were also able to provide outdoor cabinets to many of the survivors who are rebuilding their lives. These cabinets allow them some semblance of privacy and a place to put what things they now have. It is a place of comfort and safety when they have lost so much. At the end of last year, CCI was also able sent the funds to provide several hundred outdoor storage units for Japanese who are still living in emergency housing provided by the Japanese government. These storage units were weather proof to protect the precious few items that many of the survivors own. 1,000 units were delivered in the Aeon Temporary Housing area. Although they have a place to stay, it is temporary and necessarily quite small. The outdoor storage units allow for room inside their dwellings, and provide them with a place more comfortable then without them. CCI, working together with the coffee shop, was also asked to provide sewing machines at the coffee shop where classes were given for locals as well as workshops to make blankets and cold weather gear for the victims of the tsunami. CCI was able to provide ten sewing machines for Sendai. Several locals are now attending classes to use the sewing machines and others are using them to provide themselves and others with necessities. This gives a great feeling of self fulfillment and independence for people who have been living for more then a year at the mercy of those around them. China Care would like to extend a thank you to all those who have partnered with us, making these things possible. The items we have worked on have been used after consulting with locals and people working on the ground, and determining that these things are the most necessary and effective at normalizing the lives of those affected by the natural disaster. It has been several months since the devestating combination of a powerful earthquake and huge tsunami hit the eastern coast of Japan in March of 2011. It is believed to be the strongest earthquake to hit Japan and is one of the top 5 strongest to have occured world wide since modern measurements were put into use in 1900. 15,822 people are known to have died, with another 3,926 people still missing. More then 125,000 buildings were destroyed, including entire villages that were washed into the sea. The tsunami measured up to 40.5 meters high and traveled up to 10 KM inland, washing away everything in its path. Three nuclear reactors suffered partial meltdowns and small explosions. Millions of Japanese were left without electricity and water. The rebuilding has begun, and is projected to take years. Insurers estimate losses between 14 and 37 billion US Dollars. The survivors have been left with nothing. No homes, clothes, furniture, not even neighbors, friends, and family. Working with the locals, CCI was able to send and distribute bikes, hygiene products, baby and adult diapers, and other products to the affected areas. All of this was received with great joy and thanks. We want to extend our heart felt appreciation to those who contibuted to this effort. And, thanks to continued giving, CCI is now able to start a new round of projects. We are in the process of purchasing small furniture kits to be distributed to survivors who have nothing to sit on, no table to eat at, and no bed to sleep in. Through contacts, we are able to purchase the furniture at very low rates and in close proximity to the areas it will be distributed in. In addition, CCI has been able to partner with some experienced counselors, who we will support while they travel to those in need and give much needed comfort. We know that all of our efforts pale in comparison to what these people have gone through, we are thankful to be able to extend this hand of help and friendship.